Pair of 3 stone diamond earrings, with squared claws, created in an elegant trilogy design with equally sized diamonds. This truly eye-catching pair of earrings feature a trilogy of Diamonds in each stud. With a total of 6 Diamonds, each Round Brilliant cut Diamond has been expertly graded G Colour and SI1 Clarity prior to setting. With a choice of Diamond carat weights, these beautifully styled earrings suit a variety of budgets. Each trilogy earring is secured to the ear by a traditional earring post and butterfly clasp and gently drop down the ear with effortless elegance. We also provide a complimentary pair of LOX secure earring backs with every Diamond earring purchase, to add to your peace of mind. We can craft your earrings in a number of precious metals for you, including 18ct White Gold, 18ct Rose Gold, 18ct Yellow Gold and Platinum. We are also proud to offer this design in our fully ethical 18ct Fairtrade Gold options too. 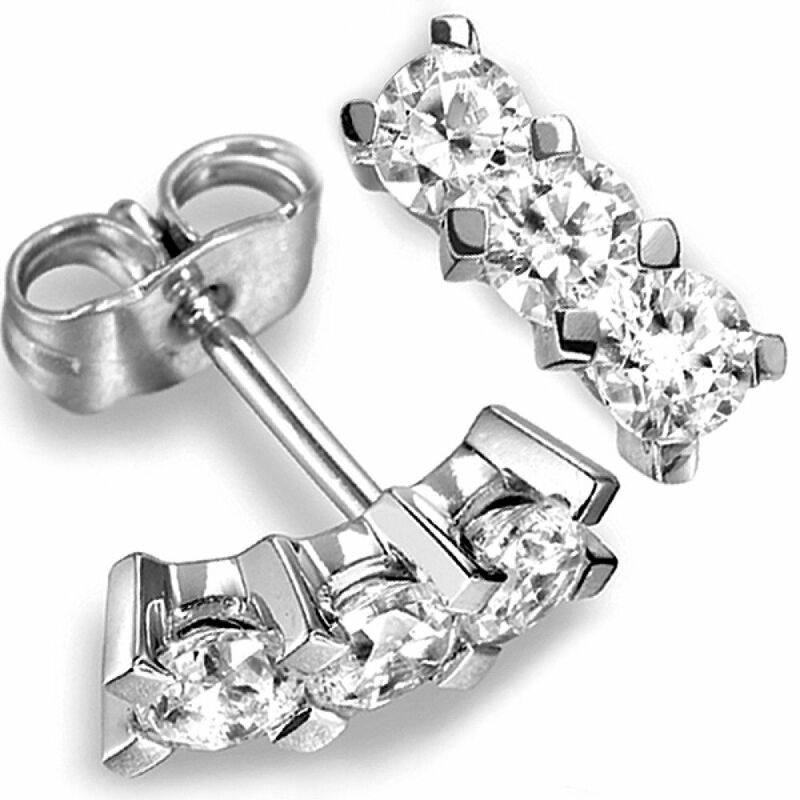 Please allow us approximately 3-4 weeks to craft your earrings for you in your desired precious metal. Your earrings will then be delivered straight to your door by a secure courier, presented in our beautiful Serendipity Diamonds packaging.